The rotational axis of the Earth is tilted about 23 degrees away from its orbital axis. Or, according to one introductory science textbook, 23.5 degrees. It’s very important, the book goes on to stress, that you remember 23.5. It’s one of the facts you should memorize apparently. Which irks me on two levels. 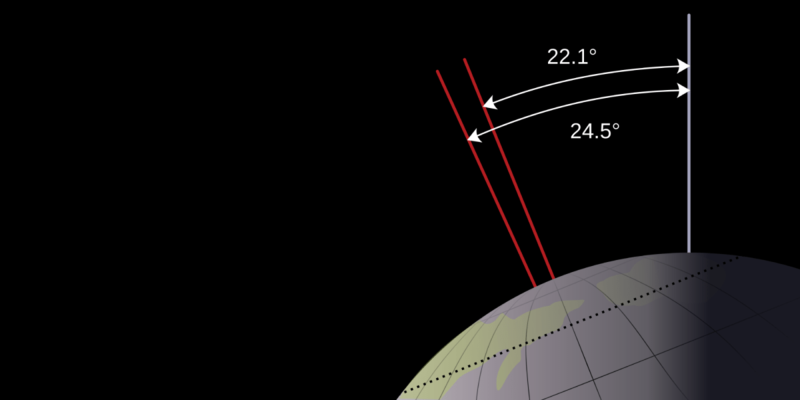 The first being that Earth’s axial tilt is closer to 23.44 degrees, but the second being that I don’t care. And neither should you. I’ve been reading through several introductory science texts as background for a children’s outreach project, and the emphasis on random facts is disappointing. It also makes for a poor representation of what science is all about. Sure, we need precise measurements and experimental results, but unless you’re working on a specific measurement, the actual value is less important than its connection to other results. So what if the speed of light in a vacuum is 299,792,458 m/s? It’s better to know that it’s a universal constant, and through relativity we know that measurements of time and space depend upon the reference frame of the observer. While most scientists have memorized many of the values they regularly use, we still look up values all the time. I can recite things like the speed of light, the gravitational constant and the charge of an electron to a few decimal places, but ask me to recite something like the Rydberg constant, and I’m at a loss. I know it relates to the spectral lines of an ideal hydrogen atom, but I’d still have to look up its value. I simply don’t use it enough to have it memorized. So don’t sweat it if you’ve ever struggled and failed to memorize facts and figures. They aren’t as important as they seem. I’m afraid this confusing weakly understood facts with science is unfortunately even increasing. I suppose one reason is, that pupils prefer straightforward learning over growing their comprehension, because it appears as a mere matter of effort and seems to guarantee a way to success. Otherwise some confidence in own capabilities are needed. This is perhaps enforced by relatively higher percentages of (formally) higher education and reinforced by teachers, who reached their final degree already this way. Brian, nice article. Can you for understanding write an article as to how the orbital tilt causes the seasons. I just can’t figure out in my head how tilt as opposed to the distance from sun causes seasons? There’s a link in the post on seasons that explains it. Lazy teachers. It is much easier, faster to grade an exam answer displaying a number or word than one that proves understanding of a concept. For instance, history teachers ask who and when the cotton gin was invented not caring whether the student understands the tremendous economic and social revolution it forced on the South. Multiple-choice technical exams for licensing candidates by the US Govt. are guilty of the same. Couldn’t agree more. If I had the “why does it matter” answers I might have gone into science in high school and college. It blew my mind when I learned that the ideal gas law (Pressure * Volume = number of moles * R * Temperature) constant (R) was just Avogadro’s number times the Boltzmann constant (k), basically expressing the law in terms of energies of single particles, i.e. PV = sum of particle energies. However, I’m used to thinking about the Boltzmann constant at the quantum level, so that got me wondering, why do the gas molecules count as the particles in that equation, and not the individual atoms or even their electrons? They get excited by the temperature by the same amount of energy on average (kT), but I guess somehow, their effect on the pressure and volume ends up cancelling out except for one particle’s worth per molecule, because they’re coupled together into the molecules, but the molecules are not bound together. Another great post. I agree that it’s much more important go to know why something matters than to memorize numbers.